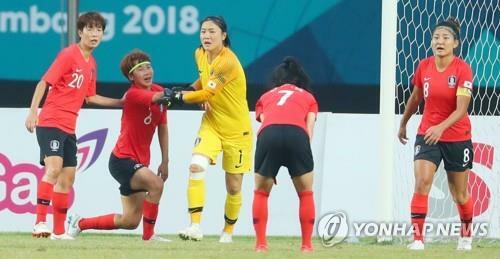 PALEMBANG, Indonesia, Aug. 28 (Yonhap) — South Korea lost to Japan 2-1 in the women’s football semifinal match at the 18th Asian Games on Tuesday. Lim Seon-joo’s own goal in the 86th minute turned out to be the winner for Japan at Gelora Sriwijaya Stadium in Palembang, Indonesia, as South Korea failed to advance to the women’s football final. South Korea will face the losers between Chinese Taipei and China in the bronze medal match. The Taeguk Ladies were looking for their first final appearance. They had won bronze medals in two previous Asian Games. South Korea, using a 4-1-4-1 formation, surrendered an opening goal to Japan five minutes after kickoff. Yuika Sugasawa penetrated South Korea’s backline and found the net with her right foot. South Korea had chances to get an equalizer later. Kim Hye-ri’s strike hit the post in the 14th and Ji So-yun’s promising effort in the 19th deflected off a Japanese defender to miss the target. South Korea leveled the score in the 68th. Lee Min-a headed down a Moon Mi-ra cross from the flank to even things at 1-1. But South Korea couldn’t hold on the last five minute. Lim tried to stop a Japanese player’s header, but instead, the ball instead went into her own net. South Korea had four minutes of added time during which goalkeeper Yoon Young-geul moved forward to join the attack, but couldn’t get an equalizer.